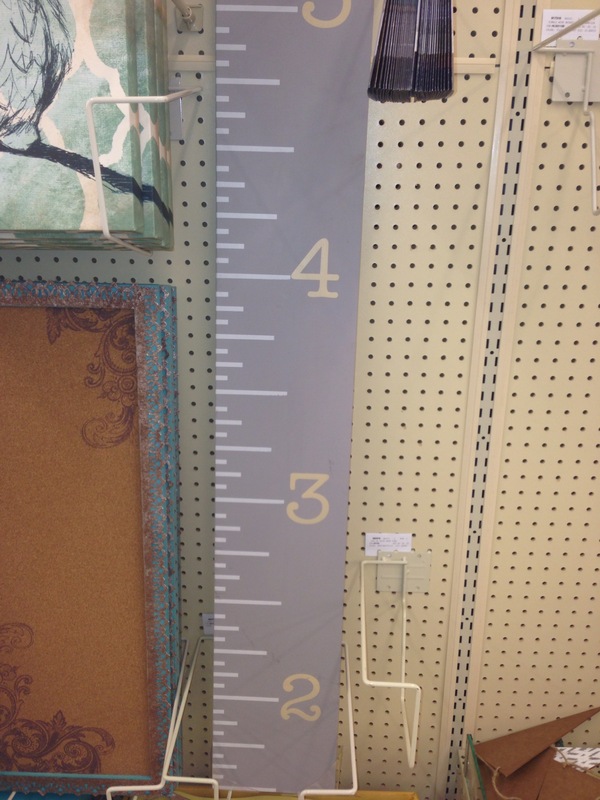 Awhile back I was at one of my favorite stores, Hobby Lobby; and I saw this ruler. It kicked my DIY lull into gear since I’ve been wanting to find something to start marking my daughters height as she grows. It also needed to be something she could keep forever rather than using a wall or door in our house. I would have just purchased this except for the fact it only went up to 5 feet. 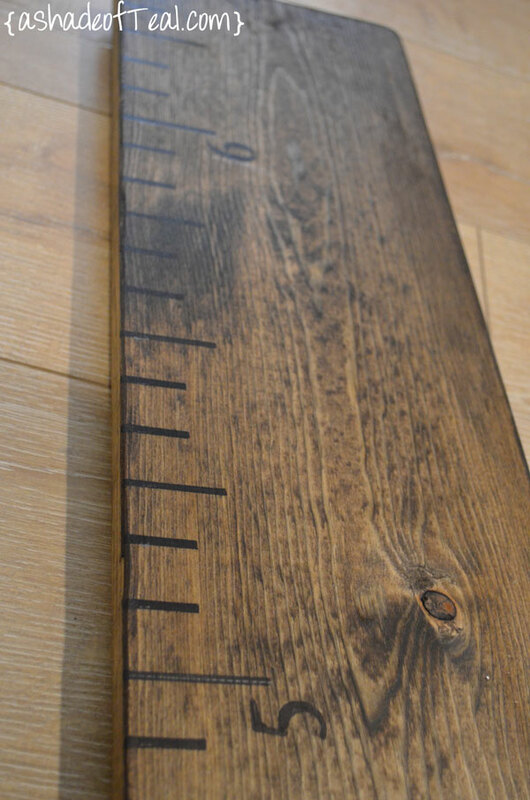 So, I decided to make my own Growth Chart Ruler. 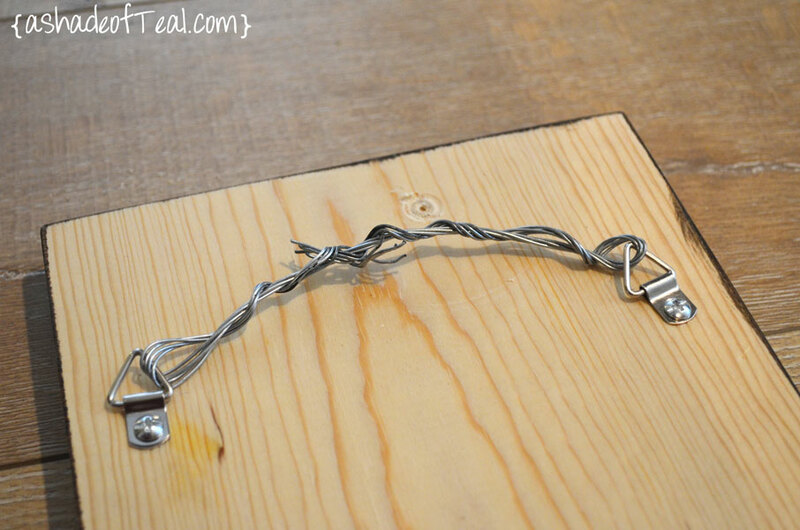 First things first was to find a piece of wood that would work. 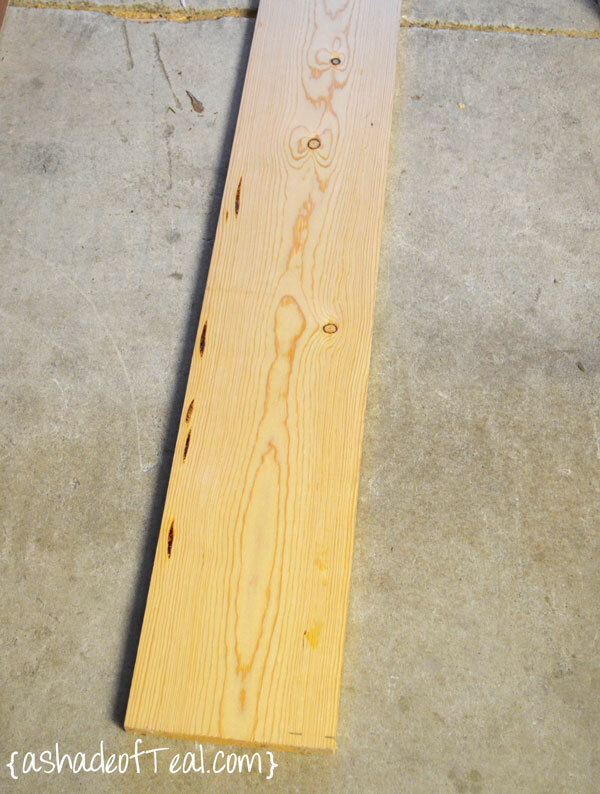 Luckily I have a nice pile of scrap wood to choose from. 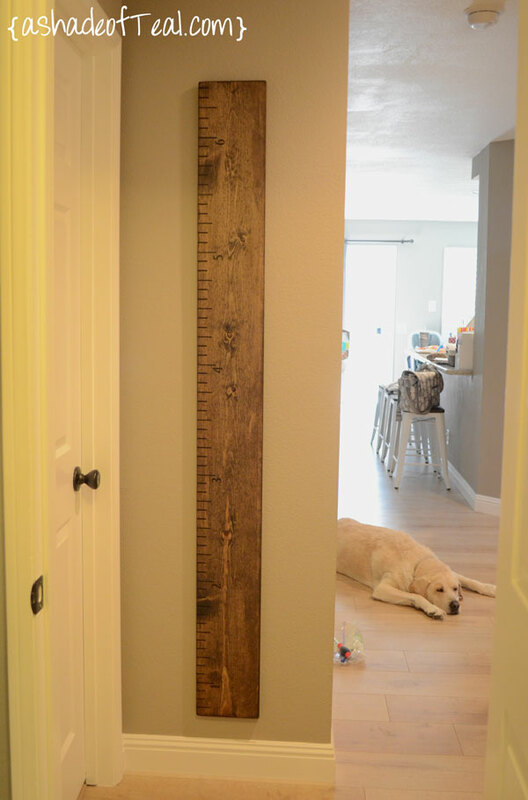 I decided to make the Growth Chart Ruler go up to 6 1/2 feet tall, in case for some strange reason my kids end up being tall! I’m only 5’2″ by the way! 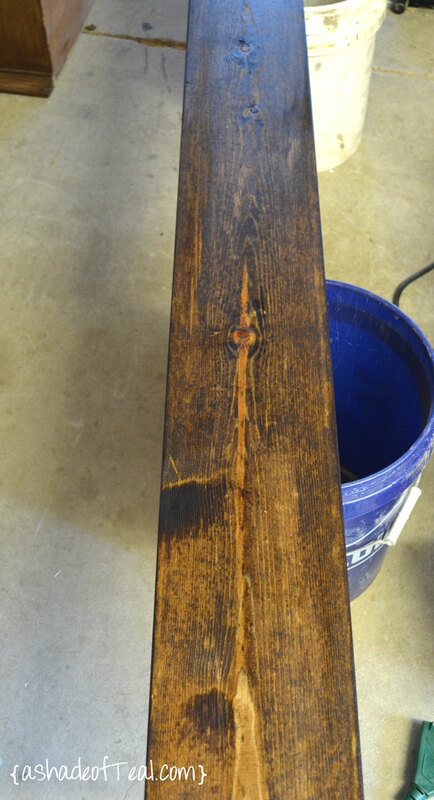 But since it would hang on the wall about 8″ up from the ground I actually made it 70″ long rather than 78″. 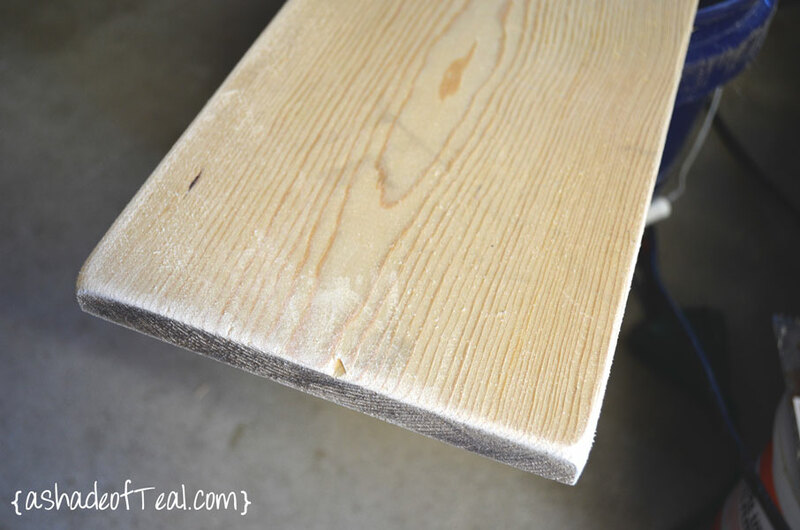 I sanded all the edges to be slightly round to give it that used effect. 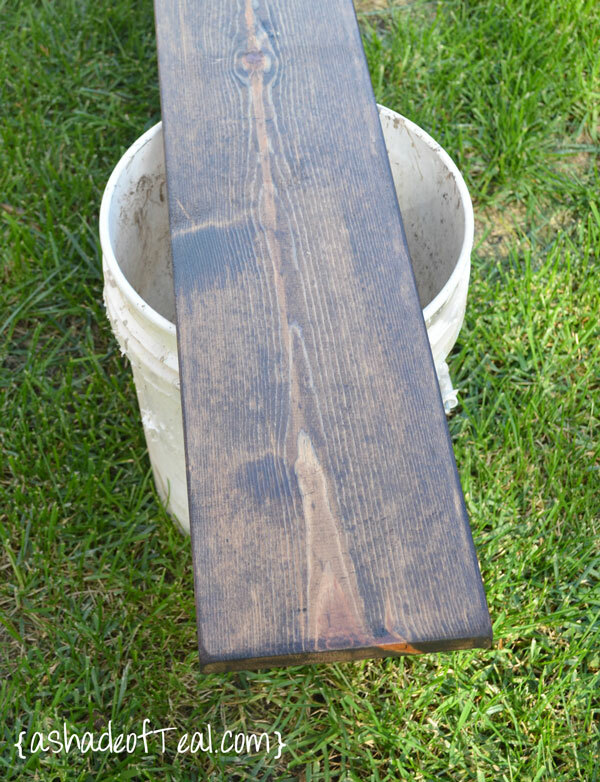 I then got out my favorite stain and added it to my Growth Chart Ruler. I made sure to not make it too dark since I still needed to add the ruler markings. 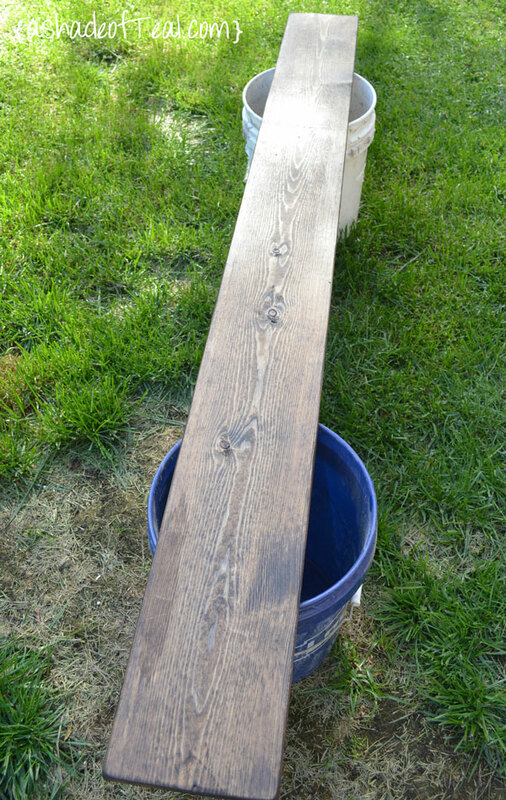 Here’s it outside drying in natural light. After it dried I brought it into my house to start adding the Ruler markings. 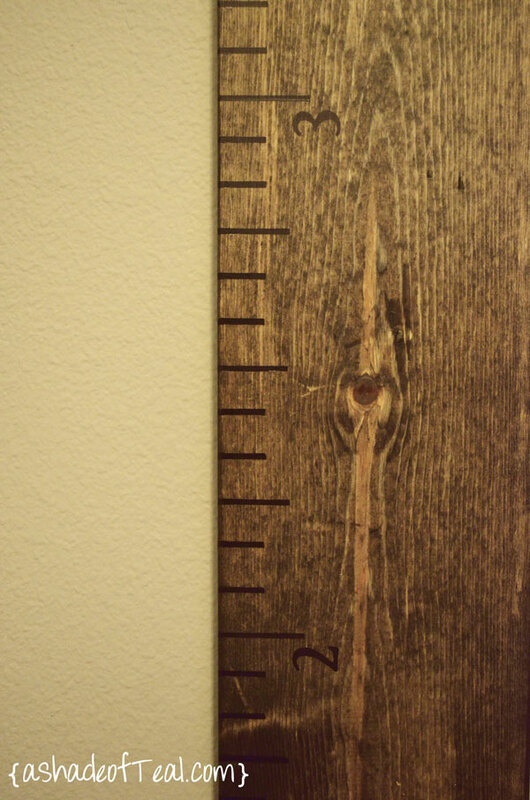 I made my marks starting at 8″ since as I previously mentioned the Growth Chart Ruler would hang 8″ above the ground. 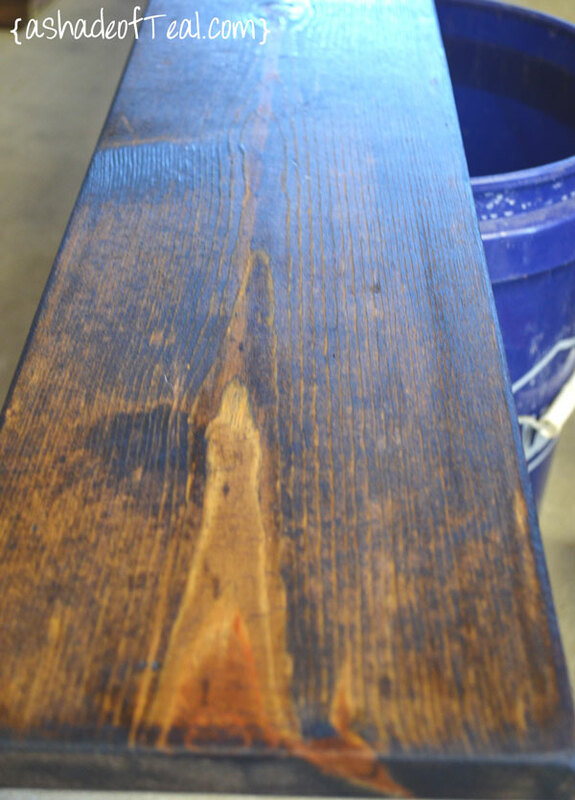 You can adjust this height however you like, but our base boards are about 6″ tall so we had to start pretty high. 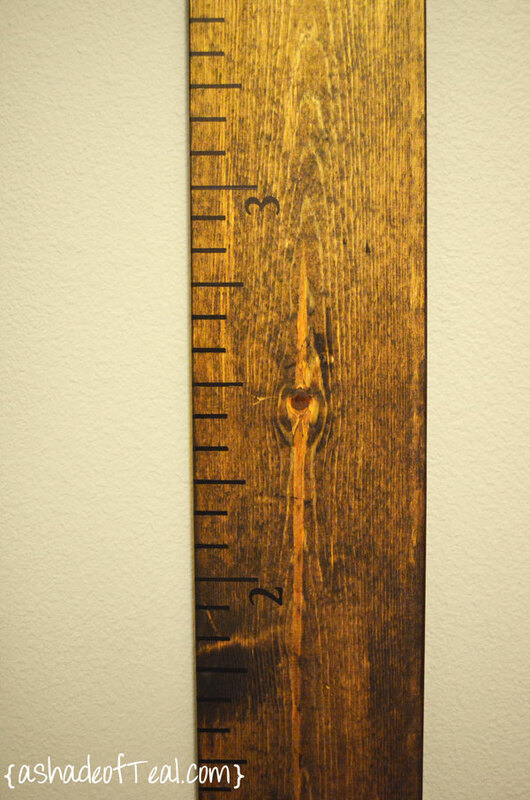 I used a small ruler to add 1″ marks and I made them 3/4″ long. 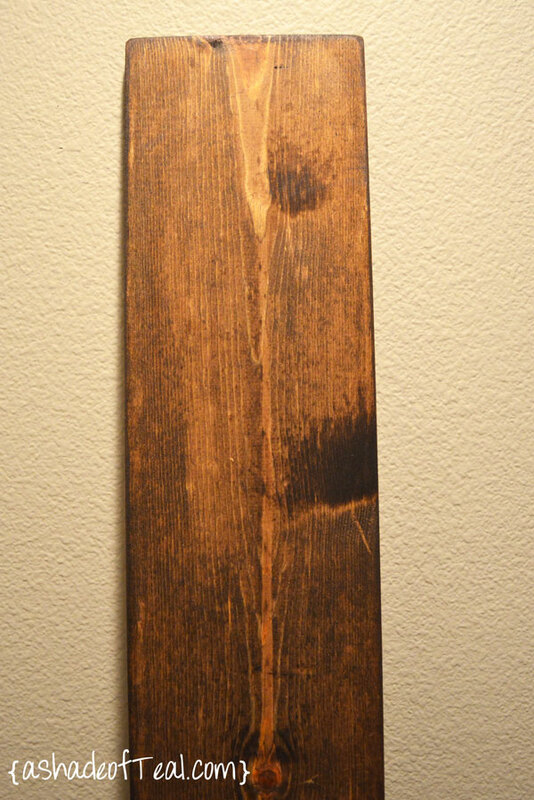 I made the quarter marks 1″ long and then the foot marks 1 1/4″ as shown here. I then used an old stencil I had to add the numbers. 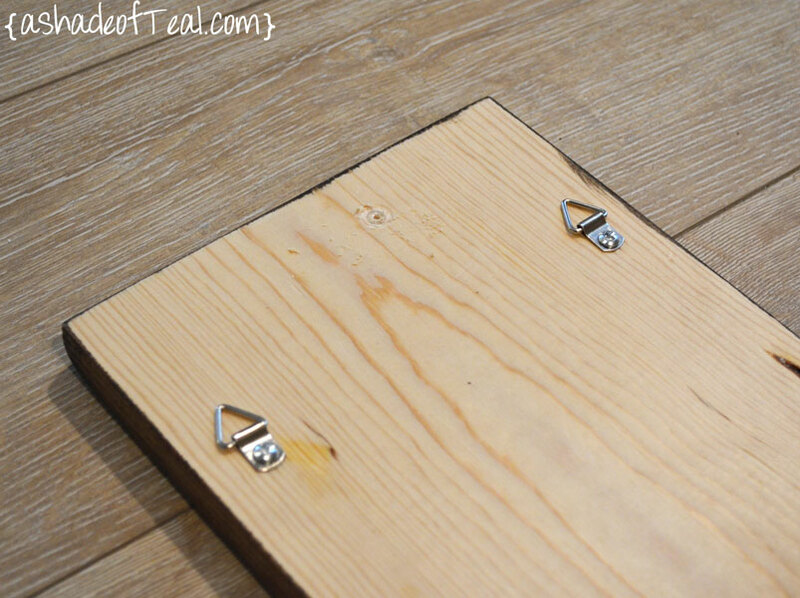 Next, I added picture frame hooks on to the back with a wire so I can easily hang it anywhere. Finally, I picked where I wanted it and measured accordingly how high to hang it. It took me a couple of tries to get it perfectly 8″ up from the ground. That’s it! As you can see I picked a small wall to hang it on, trying to photograph it was pretty hard since the hall has almost no natural light. Also, don’t mind the sleeping dog!